I didn’t know Alfred Hitchcock did comedies, but here this is. I’ve read a few different synopses that seem to tell entirely different stories, but it seems to involve disreputable people, lots of money, and family relations. 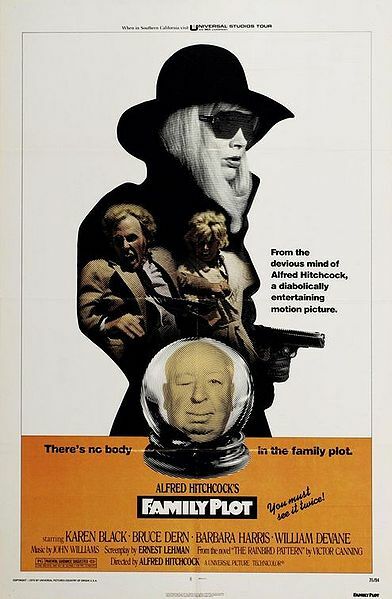 The only thing I completely understand going in is that Alfred Hitchcock was involved, so there will be massive attention to detail. Despite the massive changes coming my way this summer, I expect to be able to keep this blog going. However, that depends on how I assess the situation upon arrival. Blanche Tyler is a scam artist posing as a psychic medium. She makes her boyfriend act as a private detective for her in order to dig up information to help her act more convincing. She is contacted by an elderly woman who wants to find the location of the nephew she long ago forced her unwed sister to give up for adoption. The clues point to Arthur Adamson, a ruthless kidnapper who holds people for diamond ransoms to increase his jewel collection. The problem is, Adamson doesn’t want to be found. This is called a comedy, and I suppose it’s often funnier than it would be if it wasn’t trying to be that, but it has long stretches of seriousness that seem to completely forget that goal. I should say right now that I wasn’t able to give this movie the attention it needed. Often the comedy was rather subtle, but I can think of two or three scenes that are hilarious. The movie seemed to focus on George, Blanche’s actor/cab driver/detective boyfriend, and when in detective mode he didn’t seem very interesting. I most enjoyed the dynamics between George and Blanche and between Arthur and his girlfriend/partner, which are where most of the comedy came in. The pacing of the film seemed very slow, but about on par with most of the Hitchcock films I’ve seen. He takes his time to let everything soak in, but at the same time delivers much of his plot information through avenues other than dialogue. As with his others, so much happens just through watching people skulk around and follow each other.